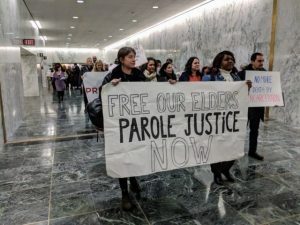 “We are outraged to learn that in 2012 the Patrolmen’s Benevolent Association (PBA) struck a secret deal with the New York State Parole Board that allowed the PBA direct access to the Board and its Commissioners. The deal provided that all statements of opposition collected by the PBA through a nongovernmental online forum would be directly transmitted to the Board of Parole for consideration. Such statements were submitted through the mere click of a button on the PBA’s website. Authors need not know the parole applicant or the circumstances surrounding their case. The Board accepted and heavily considered these letters despite the fact that they had their own public forum for submissions. This agreement between the Parole Board and PBA is not only unlawful, but compromises the independence of the Board and suggests an ugly collaboration between a state agency and a union notorious for unsavory and racist conduct. Their alignment also undermines basic principles of fairness, justice and due process, and contradicts the Executive Law that governs parole. By these laws and principles, the Parole Board must be immune to pressure from special interest groups and other political entities, to ensure that every person applying for parole is given an equal opportunity to make their case for freedom. This secret agreement comes as no surprise to advocates. The Parole Board has, for decades, been deeply entrenched in the law enforcement community, whether through staffing the Board with former sheriffs and prosecutors or upholding a long-held policy of denying parole release to all people convicted of harming police officers. While we are relieved to hear that this clandestine agreement between the Parole Board and the PBA was dismantled in 2014, we remain deeply concerned about the long-lasting and likely devastating consequences of such an arrangement. Undoubtedly, hundreds, if not thousands, of people in prison were denied release between 2012 and 2014 due to letters of opposition received from the PBA. This is unacceptable.